Technology can lead to workers being displaced in one particular industry, but this doesn’t hold for the economy as a whole. In Krugman’s celebrated example, imagine there are two goods, sausages and bread rolls, which are then combined one for one to make hot dogs. 120 million workers are divided equally between the two industries: 60 million producing sausages, the other 60 million producing rolls, and both taking two days to produce one unit of output. Now suppose technology doubles productivity in bakeries. Fewer workers are required to make rolls, but this increased productivity will mean that consumers get 33% more hot dogs. Eventually the economy has 40 million workers making rolls, and 80 million making sausages. In the interim, the transition might lead to unemployment, particularly if skills are very specific to the baking industry. But in the long run, a change in relative productivity reallocates rather than destroys employment, even if the distributional impacts of that reallocation can be complicated and significant. As productivity rises, people could just work fewer hours and enjoy the same level of consumption. But equally, they could work the same hours and devote the productivity boost entirely to raising consumption or, more likely, enjoy a bit more of both. This so-called “income effect” means working hours should fall, but by less than one for one with the rise in productivity. But that’s not the only thing going on – rising productivity tilts the relative prices of leisure and consumption in favour of the latter – what economists call the “substitution effect”. Gregory Clarke’s fascinating dataset suggests that in 1700 a craftsman needed to work for almost 10 hours to earn the 2 old pence required to purchase a kilo of beef. But by 2014 a median UK worker can earn the ten pounds or so need to buy that kilo of beef in less than hour. And so measured in beef, or goods in general, the reward for working that extra hour is much bigger. The overall effect on hours depends on the balance of the two. Angus Maddison’s 2001 magnum opus estimates that between 1820 and 1998, real GDP per capita in Western Europe increased 15-fold. Over the same period hours declined by about a half. So the productivity dividend was split about 7:1 in favour of consumption. On that basis, unless automation leads to vast productivity gains, any fall in hours would be modest and slow. It would take a 75% rise in productivity to deliver a 10% fall in hours. Or a 150% rise to knock a day off the working week. The consensus view amongst economists is that technological change is labour augmenting- i.e. it acts to increase output in the same way as an increase in labour input. If that sounds counterintuitive it is merely the flip side of assuming that innovations are labour-saving. 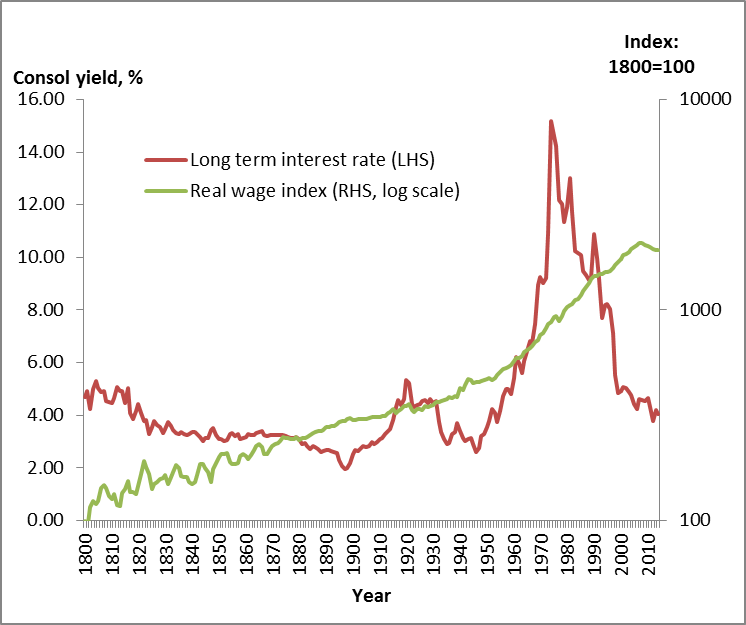 History provides a good testbed for this hypothesis – if technical change is labour augmenting, then technological change should lead to a rise in the wage rate, but leave the interest rate unchanged. The Bank’s own historical datasets suggests long rates have (periods of high inflation excepted) hovered around 4% since the 1500s. And the chart below shows that since 1800, the return to labour – i.e. the real wage rate – has grown by a factor of around 15. Of course these aggregate figures might well mask substantial variation across industry and worker groups. Certain workers may be hit very hard, especially if their human capital is rendered obsolete. Robotisation may not be good news for all workers and may pose important distributional challenges. So to argue that robotisation will benefit capital at the expense of labour you have to believe there is something intrinsically different about it compared to innovations that went before. One thing that might, and I stress might, be different is the substitutability between labour and capital. Under labour augmenting technological change, if this parameter is less than one, then rising capital to output ratios over time increases the labour share, if it’s equal to one, the labour share is unchanged. Looking at back data suggesting a constant or rising labour share, for the bulk of the post-industrial era many economists concluded the elasticity was less than or equal to one. So more capital meant its relative price had to fall by more than its quantity increased – hence a lower share of income goes to capital. How might technology change this? Imagine a taxi and its driver – there is in essence no substitutability between the two. They have to be combined in fixed proportions, and so having a taxi with two drivers, or a driver with two taxis creates no extra output. Earlier technological progress, faster cars, satnav, Uber, didn’t change much on that score. But perhaps robots will make labour and capital much more interchangeable – so the driver can be substituted by a computer, and the passenger rides round in a driverless car. If this pushes substitutability above one, growth in the capital stock over time leads to a higher share of income for capital. Indeed Piketty and Zuchmann argue this applies to a much broader range of technological change than just robotisation and has driven up inequality in the past two decades. Could robots help combat secular stagnation? But perhaps the most important historical lesson of all for economists is to remember that often the biggest implications of an innovation occur far away from that good’s own industry. Take the humble shipping container. Transporting goods in pre-packed locked containers, which can be lifted straight onto a lorry or train, yielded enormous savings relative to having cargo transported in crates which needed loading and packing individually at each port. Their inventor estimated that the combined savings on labour costs, time at the dockside and insurance for breakage and theft reduced the price of a tonne of cargo 39-fold. Bernhofen et al calculate this led to an eight fold increase in bilateral trade between countries with container ports. Whilst employment fell, productivity of labour increased nearly 20 fold. For the shipping industry this wasn’t a massively disruptive technology- though trade patterns changed, the industry became more concentrated and ironically less profitable. But by reducing the cost of trading, containerisation opened up the possibility of new supply chains and trading arrangements that were previously too expensive to undertake. And, inso doing, the resultant trade flows led to a substantial spatial reallocation of economic activity. The real macro impact of containerisation didn’t occur at sea or on the dock side. Perhaps the biggest effect of robotisation might occur far away from the industries which adopt the robots, and in ways which today’s macroeconomists could never imagine. So in the long run, labour-saving technological change means we can make more stuff. And that is a generally a good thing. In the long run it doesn’t create unemployment and might even help avoid secular stagnation. But it might alter how that output is divided up. Working out the theory behind that, and unpicking the effects of particular innovations will probably keep economists in human or robot form occupied for years to come. Next Post Collateral and market stress: what are the risks? Still progressing in the article, just up to this point. This is the issue you always hear, but you rarely hear a similar issue that’s perhaps more important, and I think is probably far more important in the short and medium run: It’s not just that robots and other AI’s may increase the share of the pie going to capital owners. It’s that they could cause massive increases in inequality in how the labor share is distributed among laborers. These technologies can send the superstar, or winner-take-all, phenomena to the moon. Moreover, an increasing share of workers due to revolutionary advance in these technologies may find that the wage the market will pay for their education, skills and other characteristics drops below minimum wage, or well below, for those who think cutting the minimum wage is the answer. What happens if these robots and AI’s make it so that 10% of the population is basically unemployable at a wage above minimum? then 20%, 30%,… Suppose at a grocery store cameras watch everything shoppers put in their baskets, and know what it is; the cart is mechanized and follows you, the cameras also recognize your face and have your payment info on file, dexterous robots can do the vast majority of stocking and unloading,… We are not far from this, and going the rest of the way looks not that hard at all in the next 30 years, from what I’ve learned of this technology. Then, about 90% of the grocery store jobs are gone. Where are those 90% going to be redeployed? They’re low-skilled laborers, where they can be redeployed are similar places where robots can also do those kinds of manual jobs, fast food, manufacturing, waiting tables,… And, as we’ve seen, no, people are not willing to pay much more, in money and time, for the human touch, to be able to chat with the checker, or teller, or waiter. They’d rather have more badly needed time and money to spend with their own families and friends. You could say, ok, the economy would expand to have just 10 times the production then, but you hit the bottleneck of lack of high-skilled laborers to do this, that I talked about earlier. In addition, you hit a lot of inelasticities of demand. Those who do still have jobs and money can only eat so much,… And costly raw materials can also become bottlenecks. So, this is not so easy to dismiss with, in the past,… We actually did have to increase educational levels and skills to prevent mass unemployment with past technological advance. But, (1) Government rose to the challenge. We didn’t have such a dominant and billionaire powered government always bad, pure free market always good, right wing. And (2) The societal level of education and skill necessary with the kinds of robots and AI’s were probably going to see will be very high indeed. It will take an incredible increase in human capital investment, from prenatal to college and beyond. The bakery and sausage factory example doesn’t make sense to me, since the size of the market for hot dogs is likely to be fairly constant. The theory may be correct, but this example doesn’t make it obvious – quite the reverse. Next, I think there’s something important to note with regard to your shipping containerization example. This caused a huge cut in the shipping jobs that existed at the time. But, these workers moved to other jobs, many still in shipping but different shipping jobs. So, all’s well that ends well. Except that with the kinds of robots, machines, and AI’s we may see in the future, it won’t be just a clever idea that eliminates many specific jobs in a specific business, so demand increases in other businesses and workers move there, or to different jobs in the same business. It will, instead, be whole classes of work eliminated. A whole class of work, or skill, or ability – say dexterous movement and sorting with good visual recognition – will be eliminated from pretty much *every* business. It’s *whole skills* that will be eliminated from employment by these new robots and AI’s, across every business, not some specific jobs that will be eliminated in a specific business, so I’ll take my skillset elsewhere. Your skillset may no longer be needed anywhere. It may be replaced everywhere, or replaced in 90% of businesses. And again, there are problems with, well, then production will just increase 10-fold to sop up all those low-skilled workers. There are very serious bottlenecks in high-skilled workers and raw materials, and there are inelasticities of demand.